The positive effects of regulating an adult (21 and over) marijuana market in NYS outweigh the potential negative impacts. Harm reduction principles can and should be incorporated into a regulated marijuana program to help ensure consumer and industry safety. Legalizing marijuana could remove research restrictions in NYS, which will enable the State to add to the knowledge of both the benefits and risks. 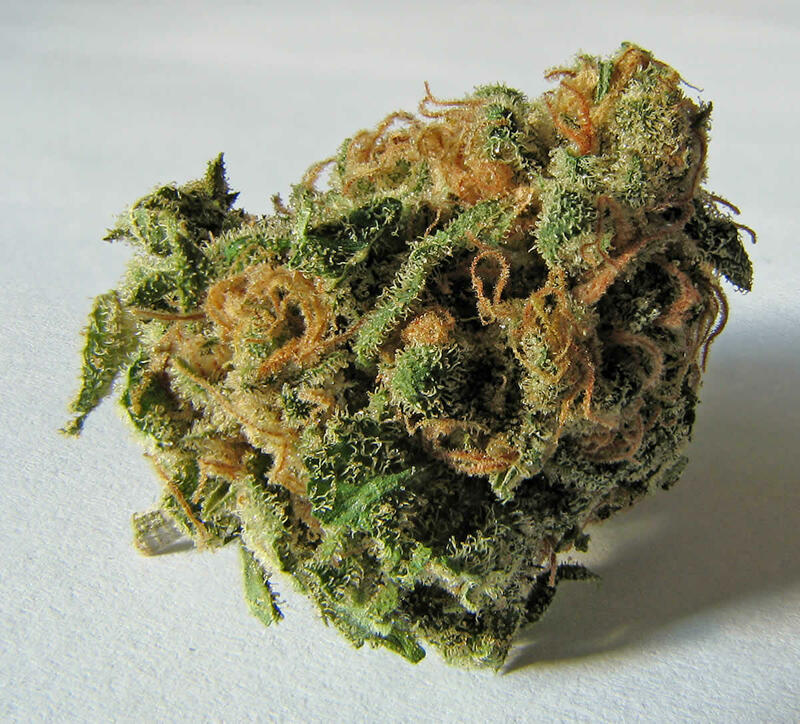 In addition, NYS would be one of the largest regulated marijuana markets. As such, there is potential for substantial tax revenue in NYS, which can be used to help support program initiatives in areas such as public health, education, transportation, research, law enforcement and workforce development. Tax revenues can also support health care and employment. Finally, legalization of marijuana will address an important social justice issue by reducing disproportionate criminalization and incarceration of certain racial and ethnic minority communities. Whatever the political machinations at work surrounding this report, it is a remarkable document. Pretty much anyone over the age of, say, 20, has grown up with government/law enforcement/schools warning against the dangers of pot. And in this report the state Department of Health essentially says, yeah, pot has some downsides, but they're probably not as bad as they've been made out to be and our society would be better off it we made it legal and kept an eye on it. Will legalization lead to more marijuana use? Or increased use among teens? 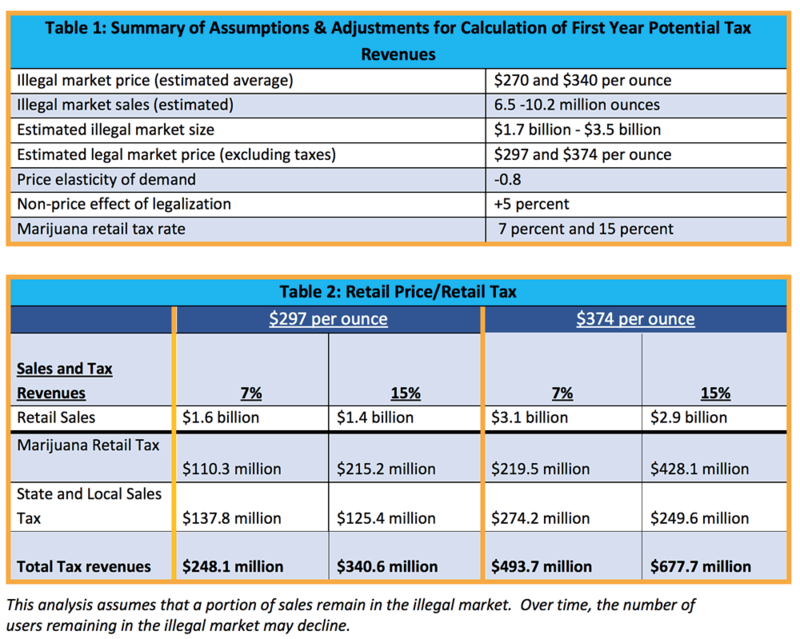 Two tables from the report that rough out the possible tax revenue from a legal, regulation market for recreational marijuana in New York State. Of course, this is just a report. Actual legislation is a whole different matter. But between this report, the fact that neighboring states are legalizing recreational marijuana, and the way public opinion now leans in favor of legalization, it wouldn't be totally unexpected to see something happen in New York in the next few years. The”BottomLine” of the study says it all. This is creating a market that will be regulated for the benefit of investors. Period. The chance that a working joe will be able to pass the barriers to entry into this market is zero. Yet another example of the parasitic class usurping a market built by the people. The war on drugs was created to break the anti war left and black empowerment movements. Mission accomplished. Now political winds change, keeping people stoned and distracted is to their benefit and there is money to be made. Years ago all the potheads were calling for legalization: "Make it legal and tax it! It shouldn't be a crime!" Now that the legalization process is underway and the government is looking into how to effectively regulate and tax it, all the potheads are screaming a different tune: "Why can't I grow my own? Stupid government always trying to make a dime!" @Ra because if it's safe for consumption why would it be illegal to grow like any other plant? Homebrewing alcohol is perfectly legal and is a fun hobby for millions. Yet breweries still make and sell beer. Tax revenue for home grown would come from purchase of gardening supplies like any other plant. In the same way that homebrewing supplies are taxed. And the ovewhelming majority of users will not grow their own. It's a non-issue, allow both. @Sean you have no idea how many people would be growing the plant, let alone selling it on the side, so please don't pretend like you do. It's also illegal to sell your own distilled alcohol, last time I checked. It most certainly is an issue, since the issue of legalization hinged on the tax revenue from legitimate businesses growing and selling it, as well as the government keeping tabs on it, not potheads skating by on a technicality. @Ra. Pothead here. If I could go to a store and buy pot, I'm going to choose that option over finding some illicit newbie grower. Just like when I want beer, I go to a store instead of hitting up my homebrewing friends. Even now, when visiting family who live in nearby states that have legalized marijuana and allow people to grow it, I plan to visit the shops even if those I know will pass me some homegrown nugs. Kind of like when I visit friends elsewhere, we'll drink beer in bars in addition to their home brews. Again, there's no difference between this and brewing your own beer and growing your own vegetables. The commercial markets for any of these things isn't hurt by people doing their own thing. Your disdain for pot smokers is obvious, so let's not pretend that lost tax revenue is your issue here. @PotHead, there are lots of false equivalencies here, so let's dig in. Anecdotal evidence isn't evidence in the slightest, so we can throw out your personal experiences when it comes to public policy. Did your friends who passed you homemade brews have a federal license to make their own alcohol? If not, you should have been reporting a crime. You need a license to even make your own home alcohol, and you definitely need a license to sell it. If your argument is to treat pot and alcohol the same way, I say great, let's charge people for growing their own. That, however, was not what was being proposed here by pot advocates, nor do I believe that's what you are arguing. My issue still stands; in the lead up to a serious conversation about legalization, potheads were crying for the government to regulate and tax it. Benefits for all! Now that the option is seriously on the table, sore losers are wondering why the government is stepping in to regulate and tax it. Sure, I'm not a fan of druggies. I'm not a fan of people who pivot on issues or lie about them. I'm not a fan of people who think their personal anecdotes are solid grounds for a public policy stance. All together, I'm definitely not a fan of druggies who have pivoted on this issue and think their loose anecdotes are enough to sway public policy. What I am a fan of is the push of legalization and a solid, organized method of regulating and taxing the new industry in much the same manner that alcohol and tobacco are regulated and taxed. The "solid, organized" part of the whole thing might go over potheads' heads, but, thankfully, potheads don't make public policy. @Ra, thanks for letting us know early in that book of a comment that we should report home brewers for crimes. Once you get to that level of insanity, there's no reason to read another word. We'll get to legalization even over your opposition and disdain. But wow, what a silly perspective you have. "You cannot produce spirits for beverage purposes without paying taxes and without prior approval of paperwork to operate a distilled spirits plant. [See 26 U.S.C. 5601 & 5602 for some of the criminal penalties. You should also review our Home Distilling page.] There are numerous requirements that must be met that make it impractical to produce spirits for personal or beverage use. Some of these requirements are paying excise tax, filing an extensive application, filing a bond, providing adequate equipment to measure spirits, providing suitable tanks and pipelines, providing a separate building (other than a dwelling) and maintaining detailed records, and filing reports. All of these requirements are listed in 27 CFR Part 19." It is not "silly" nor is it "insanity" to want to follow laws. That's a dangerous opinion to have if I ever heard one. My concern about this whole thing is the potential increase in DUI. I understand there is no objective, standardized assay to determine drug levels as there is for alcohol (blood alcohol or breathalyzer). I think that needs to be addressed before legalization. @Tim thanks for the clarification! New information is always good information, glad I learned something today. Another pothead here. MYOB and leave my weed alone. That's all. @Barold, "MYOB"... not when the government is involved and it becomes a matter of public policy! At that point it IS my business.